Why Don’t You Come Up and Cook Sometime? You could use the following link to read more, but you’d miss the Google search quote that sits beneath its clickable .edu URL “called the Harvard of cooking schools by Julia Child and the best cooking school in the world”. I care less about the Harvard part, but the Julia Child part? Her opinion counts. 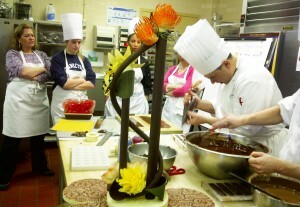 The pictures are ones I took in a Saturday class “Chocolates and Confections” I attended in 2011. It was tons of fun, culminating in a wonderful buffet lunch served by the students. I am really looking forward to participating in one of the BOOTCAMPS CIA offers. The webpage will explain more. And by the way, the campus and architecture are beautiful. Since what we really hope for is you to stay with us at Hilltop, and find enticingly delicious adventures nearby, this blog focuses on the extraordinary Winter Dining Events that two of CIA’s eight restaurants have planned for the upcoming weeks. 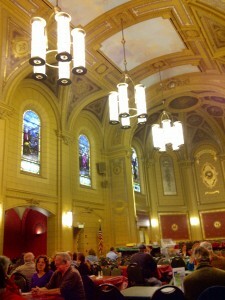 Dinner: Tuesday, Feb. 11 at 6 p.m. Lunch: Wednesday, Feb. 12 at 11:30 a.m. Dining at this grand Tuscan-style villa is a culinary escape to another world. You can also enjoy wood oven pizza and other simple rustic dishes in the more casual Al Forno Trattoria. We’re listing just the events, you can find out more about the details by visiting the website directly. Thursday, Jan. 30 at 6 p.m.
Wednesday, Feb. 5 at 6 p.m.
Wednesday, Feb. 12 at 6 p.m.
Thursday, Mar. 6 at 6 p.m.
Wednesday, Mar. 12 at 11:30 a.m.
Wednesday, Mar. 19 at 11:30 a.m.
Thursday, Mar. 27 at 11:30 a.m.
Tuesday, Mar. 18 at 6 p.m.
Thursday, Apr. 3 at 6 p.m.
Reservations are needed for all events. Popular events do get sold out, so plan accordingly. Call: 845-471-6608, Monday through Friday, 8:30 a.m.–6 p.m.
We love the Culinary Institute and its sweeping—if not windy this time of year—views over the Hudson. It’s another great reason to come visit the Hudson Valley and Hilltop House. As Julia would say, Bon Appetite! Wow, cold weather can get to me, but I was thinking about our vegetable garden and the idea of cold frames came to mind. Funny how the mind works. Whenever I see old windows being thrown out by the side of the road, I am half tempted to load them into the back of the van, take them home to Hilltop House and have my husband construct cold frames for me. Cold frames are mini greenhouses usually installed on the south side of the house (our south side is our driveway and parking side, largely tree covered—not so great). The ground can be dug down within the pocket of the frame, but the house itself—if you have a cellar—might provide some heat to the cold frame. Essentially, a cold frame is a garden season extender, where cool weather crops—lettuces, leeks, carrots, spinach, mache, herbs and other greens, can actually do their growing much earlier (and later) than possible as they are protected from frost, driving rain and freezing. Containing the plants keeps them less susceptible to rodents, and in cooler weather, bugs are less of a problem too. An added layer of hay when the season turns blustery serves as a blanket for the plants. Another great use of a cold frame is to “harden off” young plants before you put them into the garden to grow. Seedlings sometimes can’t manage that transition from greenhouse nursery to the outside—due to coldness and wind, and providing a protected but less warm environment will get them through that stage of growth. Best case scenario is that the window frame with glass and all, is large enough that you can hinge it to the frame beneath. The frame base should be higher in the front, and lower in the back so the window—or light as it’s called—picks up the sun’s rays more directly. During the coolest times, the frame stays closed, but gradually during warmer days, we prop open the window with a pole to allow the sun’s magical rays to move along the process. If you’re into vegetable gardening, a cold frame is a great way to stretch your growing season, and ours, in the Northeast can be short. There are many DYI instructions on the web if you google cold frames, and there are kits and ready-made frames if you have the budget for them. Right now, just wondering when this cold will be over; I’m about ready.